If you live in an area that experiences brutal winters, you know how important it is to have the right equipment on hand to tackle the snow. With a John Deere motor grader, you’re already on the right track to being prepared for Old Man Winter. There are a number of attachments that can be used with a John Deere motor grader to help you move and plow snow in your area. Let’s take a look at some of the add-ons that will make your job easier this cold weather season. With these brake lights, you’ll be highly visible on the road, especially when the snow is falling hard. This enhances safety when you’re plowing around other vehicles. The Weather Band Radio with Bluetooth ensures that you’re always on top of the weather, right inside your cab. No matter where you are, you’ll have up-to-the-minute updates on Mother Nature. This sign is essential for your motor grader when you’re working in heavily-trafficked areas. It will let others know that you are in the midst of handling large loads of snow, encouraging them to use caution around your equipment. Laminated glass comes standard with every John Deere motor grader. This means you’re encased in only the strongest glass while you work, enhancing your safety and giving you peace of mind. The rear counterweight comes with a rear hitch pin which helps balance the motor grader. In turn, power does not slip away when the equipment is in use. 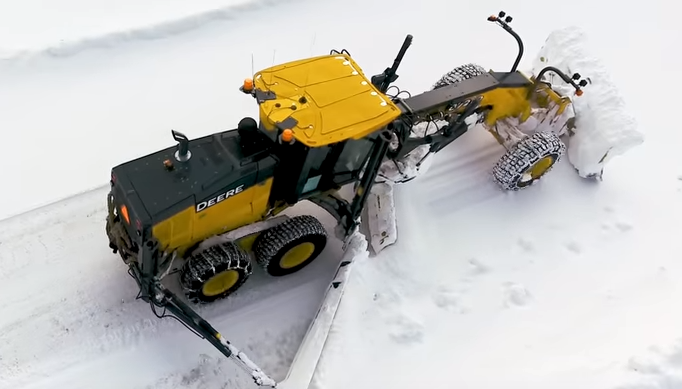 Operators can opt for video showing the rear of the motor grader, which allows for more visibility in harsh weather conditions. With video, users have more confidence maneuvering the machine in heavy snow. With the blade impact absorption system, the structure of the motor grader is protected when concrete shifts from the cold temperatures, driving frost in the ground. The engine coolant heater for motor graders is diesel fire fueled. It is specifically designed to reduce engine idle time, saving fuel and increasing starter and battery life. If you have any questions on John Deere motor grader equipment for winter, contact your local John Deere dealer for more information.